The Australian Agricultural Co this morning reported extreme stock losses on some of its Gulf properties in Northwest Queensland, in the wake of unprecedented flooding across the region. The satellite map of the Gulf region and the Flinders and Saxby River systems published this morning (click here to view) shows AA Co’s Wondoola Station almost entirely under floodwater when the image was taken on Saturday. Managing director Hugh Killen flew to the company’s flood affected properties late last week. The company this morning told the Australian Stock Exchange that heavy rain and severe flooding throughout northwestern Queensland had severely impacted four of AA Co’s 21 properties. The four properties have been subject to unprecedented levels of flooding not seen before in the Gulf region. “Our immediate focus is on our people, the welfare of our animals and the tight-knit communities in which we operate. The full effects of the flood are being managed and measured in real time,” a company statement said. Of AA Co’s Gulf properties, Wondoola station, bordered by the Flinders and Saxby Rivers, has been most affected and its current herd of about 30,000 head of mainly composite cows and their calves is expected to sustain extreme losses. 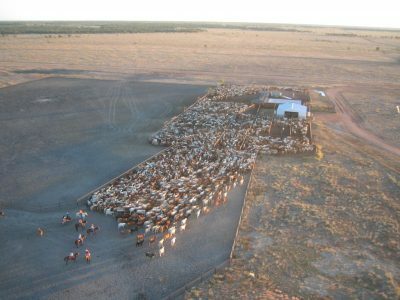 Further south, Canobie, Dalgonally and Carrum stations, which had about 50,000 head of mainly composite cows and their calves on their books, are expected to sustain lower, but still material losses, the company said. South-western Queensland and the Barkly in the Northern Territory, where the majority of AA Co’s properties are located, continue to experience below average rainfall for the season and extreme heat conditions. As flagged in the company’s half-year results, the seasonal conditions will significantly increase station operating expenses, particularly grain, feeding and transport costs. “The overall impact of these seasonal conditions on the company’s financial earnings for the 2019 financial year (ending March 31) is expected to be material, and management is currently working through an evaluation of the situation. An update will be provided when further assessments from the ground are available,” AA Co said. “While we are still assessing the impact of this tragic situation, our balance sheet and financial position remains strong,” the company told the ASX.